These days there are many people that have ideas about what meditation is and how one should do it. This tendency is a result of all the information on available on the internet and published books from all kind of teachers, or so called teachers. Its hard to find ones way in all this information. Many of them ask a lot of money to do their courses and to get a certificate. Also these days people tend to do a course for a couple of years and going to teach themselves. I’m not sure this is the right way, and of course they ask money for it as well. If I speak for myself I meditate for 22 years now started in 1994 and I still haven’t the idea to teach myself. I think one should learn this from an authentic teacher. There are hundreds of methods of meditation. The one I use is from the Tibetan Buddhist tradition and helps me a lot on my path as I wrote on the influences on my Path part of this blog. Its called Shamatha or calm abiding along with the Mantra of Padmasambhava or Guru Rinpoche. Its my daily practice and cornerstone of all other practices and meditations I do. One doesn’t have to be a Buddhist to use these principals since they are universal. Seven line Prayer to Guru Rinp0che. A very powerful invocation of Guru Rinpoche. I pray you, come and confer your Blessings. My favorite Mantra of Padmasambhava. Chanted by a great Master. 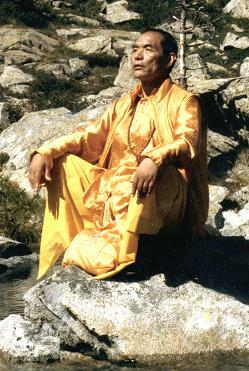 Chagdud Tulku Rinpoche. This Mantra I use a lot. The 100 syllable mantra. I use this mantra often as well. Its a purifier and has a lot of power to heal others. Its important to do this practice daily. Better 5 minutes a day then 1 hour a week. One should be enter into a state of being that one maintains the whole day long. Integration of this state of mind is essential otherwise its a technique that one does once or twice a day and no one benefits from it. Discipline, patience and balance is what it requires to do this practice. Sometimes it takes many years before results are experienced. And this can be very difficult in a society where people are used to instant results. Actually one should let go result since it only makes more concept how it should be and this is an obstacle on the Path. Beside this for I use also a mediation I’ve learned in Amorc (used in mysticism) and the Hermetic order of the Golden Dawn, the A.’.A.’. and from private teachers. Sometimes its also a mix with ritual. To have a quiet mind and have an understanding of the mind is essential to make progress on the Path no matter what spiritual path it is.